Millions of Christians pray daily and nothing seems to change in their lives. Yet Jesus said in John 14:13 "I will do whatever you ask in my name." Are we asking the wrong things in our prayers and not praying in the right way? This story's fuller version is originally published at ArmenHareyan.com at What Should You Ask in Your Prayers and Why Aren’t They Always Answered? This writing aims to cover two points. 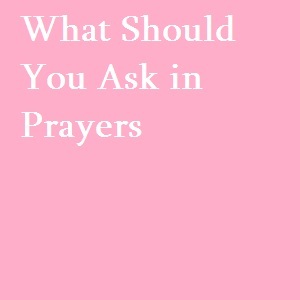 What are you asking for in your prayers and how are you praying.The answer two these two questions may help to shed light on the above-mentioned dilemma. Even more. Our Lord Jesus said those who believe in Him will do things even greater than what he himself did during his earthly life. "Very truly I tell you, whoever believes in me will do the works I have been doing, and they will do even greater things than these, because I am going to the Father," He said in John 14:12. Tens of millions of Christians (if not more) go to church every Sunday. They pray and take communion. Many of these people even pray daily, but nothing seem to change. The life remains the same, and we seem hopeless against all types of diseases, illnesses and the fear of the unknown. Imagine a recovering alcoholic. Let's call this person she. She is jobless and is looking for a job. She thinks because of her good knowledge of the wine industry should could be the right person to work in nearby wine and liquor warehouse. She is praying very hard to get that job. If you were God, would you answer that prayer positively? Probably not because there is a likelihood that she will start drinking again and destroying her life. But you are God and you know everything. You don't want to put your own child in a position where she can easily compromise herself and harm it. I think now you are getting my point. Do we really know what is good for us and what is not good for us? If you consider this question from this life's point of you probably you do (not sure though), but if you consider this question from the point of view of the Eternal Life you don't. God looks at what is good for us from the point of view of eternity not from the point of view of the temporary earthly life. We do not see our souls, how can we know what is good and what is really not good for us? We may start to really understand these things if we seek the Eternal life first and His rigorousness. Then the rest of the things that we need in this world will be given to us in excess, Jesus says in Matt. 6:33 and makes one thing clear if you read Matt. 6:31-33 in reverse order: we will eventually lose food, drink, clothing and all things that you call earthly prosperity if we don't see His Kingdom and righteousness first. The point is: we don't really know what is good and what is bad for us. Putting things in the right perspective "we know that in all things God works for the good of those who love him, who have been called according to his purpose." Rom. 8:28. Therefore, how do you know from the eternal life's point of view if health or sickness is good for you? May be illness prevents you from doing something really really bad, which could destroy your entire life? May be sickness prevents you to take pride in your earthly possessions and thus aims you to humble yourself and put your life in the correct perspective? The point is no one knows what is good and what is not really good for themselves from the point of view of accessing Eternal Life. Only God knows the answer this question and we learn from Romans 8:28 that all things work for good for us if we follow His purpose and remain in His love. Therefore, what do we ask in prayer? Of course, The Lord's Prayer, which our Lord Jesus Christ taught us includes everything we need and we should pray it daily. Yet, there is another beautiful word we hear a lot during our worship services, which early Christian fathers have successfully incorporated in a short prayer called Jesus Prayer. The word is "mercy." The only thing we can really ask God humbly in our prayer and show that we fully trust Him is "Lord Jesus Christ, Son of God, have mercy on me, the sinner." When you repeatedly say this prayer from your heart with attention, you basically say the following. Lord Jesus Christ, I really don't know what is really good and what is bad for me. You know it and I fully trust you and love you. Therefore, the only thing I ask is your mercy, your will. You may have noticed that during prayers your mind wonders around. Sometimes we can go around the world twice - figuratively speaking - in a 2-minute long prayer. Our mind is not fully focused on a prayer. Imagine this. You stand in front of your boss and present a report, but your mind is wondering elsewhere. You just say words that you are used to. He is trying to tell you something for your own good and you are not listening because your mind is not focused. Is this acceptable? If it is not, then how is this type of behavior acceptable toward God? Many times we merely recite prayers, but our mind is not fully focused. Church fathers say that prayers are not supposed to be pleasant and relaxing meditative activity, rather prayers is the place where you literally fight to keep your attention focused on God. You can only do this if you ask for his help. For example, try to pray the Jesus Prayer 10-20 times and reflect afterward how many times your mind lost its focus. Is God pleased when we pray to Him without focus and ask things that may not be good for us? Will you give your children things that you know are not good for them, but they ask for them constantly? Will you be really happy give your children things when they ask for them just to ask but their mind is not with you, their attention is not with you when they are talking to you? You see how it works friends? Let's contemplate on these things. Our Parent wants a healthy and loving relationship, the same we want from our children, not a give and take trade.